When your garage is ready for an improvement, look no further than Custom Garage Works! 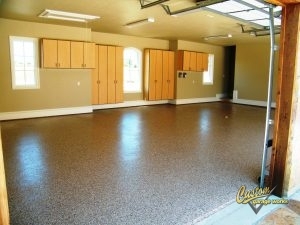 Known for our professional garage floor coating in Red Oak, TX, we originally began our business in 2003. We decided to create the perfect garage for ourselves and our growing families, and when we could not find what we were looking for within the existing industry, we decided to jump in ourselves. Presently speaking, we are proud to provide our clients with some of the best garage storage solutions on the market, as well as floor coatings that are tougher and more durable than traditional epoxy. Our team is professional trained, and we are passionate about designing custom garages, with impressive garage floor coating results across DFW. Out of all of our services, our most common services is the polyurea polyaspartic floor coating in Red Oak, TX. This is because our polyurea polyaspartic coatings cure into a superior finish that lasts for decades. Thanks to the tough composition, our polyurea-based floor coating is resistant to changing color and failing that can occur with epoxy. And due to our use of a diamond grinder instead of harmful acid etching for floor prep, we can offer a greater amount of adhesion, which leads to a quality installation. If you are interested in hearing more about our garage floor coating service, please schedule your free estimate when you call 214-494-9068 or 817-308-1305. Garage Floor Grinding Our diamond grinding techniques will help you get the optimum surface to adhere your floor coating to. Epoxy Coatings Epoxy coatings are not the best choice for coating your garage floor, but they are relatively inexpensive. And More! 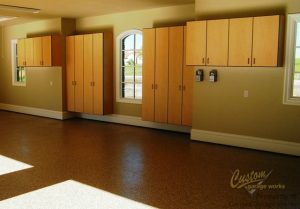 If you are looking for other garage floor options, click here to see our other services! When you choose a storage solution from Custom Garage Works, you never need to shuffle through mountains of clutter in your garage again. Your garage looks best when it is clean and organized. To meet the unique organizational requirements of our customers, we offer a variety of different organization products, including overhead storage racks and cabinets. All of our garage cabinets are secured to the wall for added safety, and our overhead storage racks are stronger and more dependable than the others you will find on the market. At Custom Garage Works, we are dedicated to installing the perfect garage floor coating in Red Oak, TX, and designing the most effective organization solution for our clients, and we look forward to serving you soon! Overhead Storage Racks When you want to get more from your overhead storage space, our storage racks provide resilient and dependable storage. Storage Cabinets These custom cabinets are different from any other garage cabinets you will find in this area, thanks to their extreme durability. Car Lifts Are you almost out of space for your cars? Our garage auto lifts can assist you! And More! Our organization solutions are affordable and efficient methods to improve the look and atmosphere of your garage.